NMM 10145. Parade drum by Ludwig & Ludwig, Chicago, ca. 1917. Stamped on washers around lug support posts: CHICAGO / LUDWIG & LUDWIG. Mahogany shell, natural finish. Combination rope and rod tension. Six thumb-rod screws below the snare head rim adjust the tension on the rope. 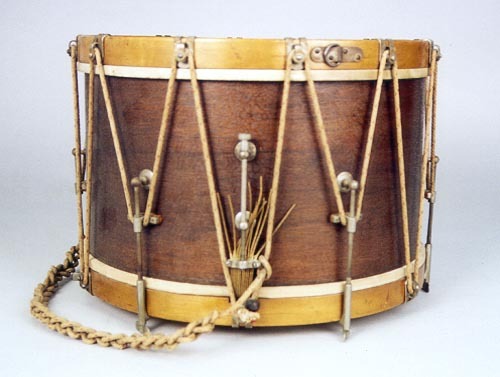 Maple rims with roller hooks, six on the snare head rim and twelve on the batter head rim, through which the rope passes. Military strainer. William F. Ludwig II Collection, 2002.